From about noon on, the Multi-Agency Command Center in the Public Safety Building began filling with top-ranking officials from government and law enforcement. Federal officials were speaking loudly about the consequences of not regaining control of the streets. State Patrol Chief Annette Sandberg described the federal officials as in a "kind of panicky mode." The decision -- never seriously questioned by those in charge -- to guarantee the AFL-CIO parade took place had several requirements attached to it. First of all, the declaration of civil emergency was already in motion. There wasn't really a question of whether it was going to happen, but only if the crackdown would catch the AFL-CIO parade before it withdrew from downtown. At 12:45PM, Governor Gary Locke authorized his chief of staff to begin preparing to call up the National Guard. An hour earlier, State Patrol Chief Annette Sandberg had ordered State Patrol troopers in Eastern Washington on higher alert and dispatched a 22-member Civil Disturbance Team from Spokane to drive the 400 miles to Seattle. Traveling at top speed, they would not arrive before dark. Shortly after Locke set the National Guard in motion, his office in Olympia received a telephone call from a furious Secretary of State Madeline Albright. Albright demanded the Governor immediately take action to release her from her hotel where she was trapped by the demonstrators. The Governor would later get strong pressure from Attorney General Janet Reno to crack down on the protests. Governor Locke was able to claim that he was taking action -- preparing to call up the National Guard, moving State Patrol troops over long distances and pressuring Mayor Schell to declare a civil emergency -- but all of these things would take time. What he did not do was accept full responsibility and declare a state of emergency. That was reserved for Schell and Stamper. Locke's staff counsel began compiling a chronology of the Governor's actions for the now-inevitable inquest. SPD Assistant Chief Joiner prepared more immediate action. 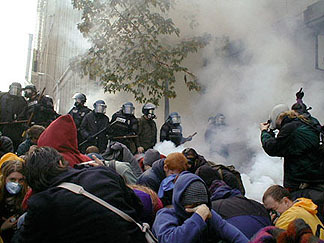 The police attacks on the protesters reached a peak shortly before the parade departed from the Seattle Center. According to police sources, nearly all of the available tear gas was expended before the parade approached downtown. [ ] On the police radio, one police leader reported: "We're surrounded, we're out of tear gas and we're withdrawing." In the preparations for the protest, Mayor Schell and Chief Stamper had laid in stocks of about $20,000 worth of gas. This was one-fifth the amount recommended by federal officials. According to the Seattle Post-Intelligencer, police officers "took matters into their own hands" to obtain new supplies of gas and pepper spray. More recent information suggests that the new supplies were part of Joiner's "messy" post-parade attack plans. Things quieted down while the police organized new supplies of gas and pepper spray. Officers sped to Auburn, Renton and Tukwila police departments, as well as the King County Jail and Department of Corrections, emptying munitions stores and ferrying the supplies back to downtown. Other officers bought additional chemical agents from a local law enforcement supply business. Meanwhile, a police captain flew to Casper, Wyoming to pick up a large quantity of gas, "stinger shells" and other paraphernalia from Defense Technology Corp., a subsidiary of Armor Holdings. The locally-obtained gas and pepper spray were driven as close to the street action as possible. The munitions were transferred into gym bags and knapsacks which were then run through the streets by plainclothes detectives One officer, told more gas is on the way, got on the radio to say: "Lieutenant, I love you now." Other preparations did not go as well as the deliveries of tear gas and pepper spray. The declaration of civil emergency was delayed until 3:24PM, preventing police reinforcements from other law enforcement agencies and the National Guard from being legally deployed until long after the AFL-CIO march had withdrawn. Assistant Chief Ed Joiner's "messy" plan was also thwarted by the flat refusal of the Seattle Fire Department to turn fire hoses on demonstrators, a detail which was not reported in the press until long after the protests were over.